Denise is a “trini to de bone” having been born and bred in Trinidad & Tobago. She is married and has one son. Since 2013, Denise has been working with Amizade, when she welcomed the first group of students to Trinidad and Tobago and Samise Villa. Her passion is “serving people”, having served as the Vice-President of the Young Men’s Christian Association of Trinidad & Tobago (YMCA) and holding executive positions in several other community organizations. 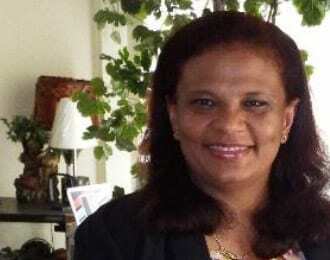 She also served as a Local Government Representative in the Port of Spain City Council for 18 years, from 1992 to 2010. Fulfilling her dream of being the owner of her own business enterprise, Denise has been an entrepreneur since 1996 in the field of the Food & Beverage and the services Industry. She is also very active in the Tourism & Hospitality Industry as the founding President of the local Bed & Breakfast Association and former member of the Cabinet-appointed Standing Committee for the Sustainable Development of Tourism for Trinidad & Tobago. She is also the Vice Chairman, representing the Caribbean, of the Inter-American and Caribbean Network of Small Hotels. Denise continues to be in the “people business” as the Owner/Manager of Samise Villa, a Bed & Breakfast facility in the City of Port of Spain, Trinidad and Tobago, established in 2008. In thriving to achieve the objectives of Amizade, Denise facilitates the activities of participants and hosting the many students who seek experiential learning through travel, while forging lasting relationships and friendships.